Tuesday July 16th 1878 I got very little sleep last night for May was sick again. began the ironing as soon as I ate my breakfast. Hatt did not get home till late. In the afternoon she and Mother were both away. I took care of May and fixed my white over-skirt and waist. Weather still intensely warm. Wednesday July 17th 1878 I went to town this morning. I got home by nine oclock. I got stuff to fix my old blue silk skirt. I worked on it all day. Win was over this evening. May was better during the day but at supper time was worse again, she must certainly have ague. 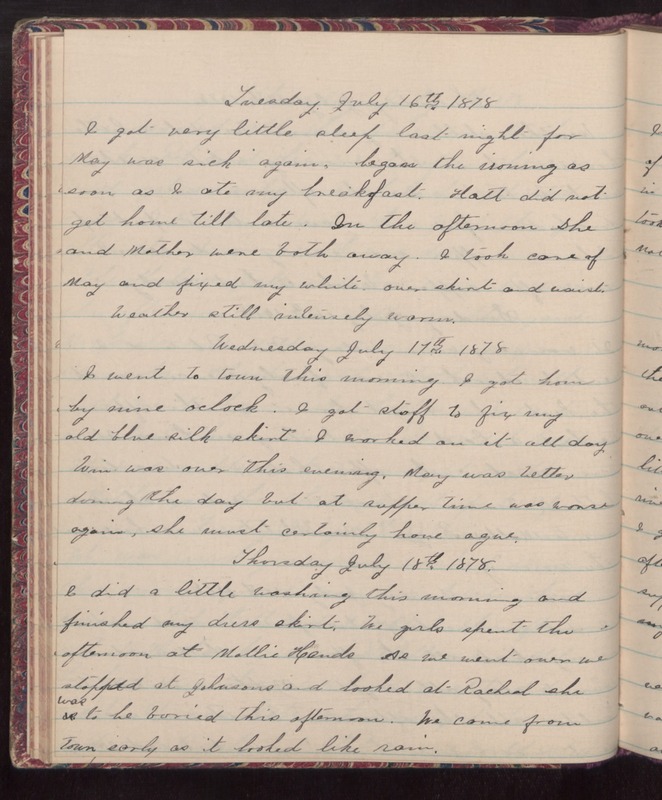 Thursday July 18th 1878 I did a little washing this morning and finished my dress skit. We girls spent the afternoon at Molly Hands. As we went over we stopped at Johnsons and looked at Rachel she was to be buried this afternoon. We came from town early as it looked like rain.